What a cute and inexpensive gift to give your Holiday Hostess! On one of the websites I was on this past week, there was an ad from SU, showcasing the Jingle Jar they made using the new Decor Elements - Jingle all the Way. 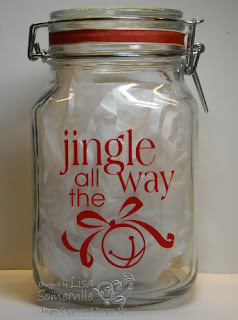 While I was out running errands I found a great jar at WalMart for under $5 to use with my Jingle all the Way Decor Elements. I like this size jar, as it's the perfect size for homemade chocolate covered pretzels. Where are the pretzels you ask? Well, with 2 boys and my DH, I can't keep them in the house long enough! If you'd like to order the Decor Elements shown here, or any other Stampin' Up! products, simply click here to access my demonstrator business website, then click the shop now button! Did you use the small size DE? Thanks! Love your gift ideas! Also love the blog candy, I'm keeping my fingers crossed. Thanks for your inspiration!! !